Johnson, Killen & Seiler, P.A. is the oldest law firm in Northern Minnesota, having been founded in 1888 by Charles O. Baldwin. In 1890 he was joined in the practice by his brother Albert. The firm has continued to grow both in size and reputation over the last century, representing parties in some of the biggest cases in our region. We measure our success not on a monetary scale but by the extent of the trust and confidence our clients place in us. For over one hundred years we have maintained that bond of trust and pledge to continue to earn that faith as we represent you. Johnson, Killen & Seiler doesn't rest on its history. Whether it's defending employers in a labor dispute or planning for management succession in a closely held compnay, the firm applies an aggressive and knowledgable approach to each legal problem. Involvement in a wide variety of industries assists the firm in attacking each legal problem with expertise and an eye to industry specifics. This care and concern for client legal matters is athe the heart of Johnson, Killen & Seiler's rapid growth that places the firm among the region's largest law firms. The firm's clients range from major regional companies to international businesses seeking representation. 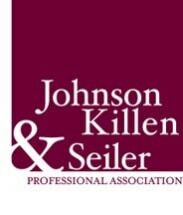 Johnson, Killen & Seiler is often a part of doing business for the firm's clients in northern Minnesota and Wisconsin. Practice areas of particular strength include business law, labor and employment law for employers, health care, litigation, family law and mediation and trusts and estates. With superior legal representation as a foundation, Johnson, Killen & Seiler continues building its longstanding tradition of trust.